Sports medicine is an exciting healthcare specialty that focuses on helping people prevent sports/musculoskeletal injuries, recover from sports injuries, and enhance their athletic performance. Sports medicine isn’t just for athletes. As athletic participation becomes more popular for people of all ages, there is an ever-increasing need for these services. The FastMed Sports Medicine program is currently only available at select clinics in Arizona. What is a sports medicine provider? Sports medicine providers are medical professionals who posses in-depth knowledge of musculoskeletal injuries and their management. Sports medicine physicians have most often received additional qualifications in sports medicine after completing specialized training known as fellowships. Other sports medicine providers, such as physician assistants, earn their qualifications through specialized training and experience in the field of sports medicine and orthopedics. When you visit a sports injury clinic, the provider should have a proven track record diagnosing and treating sports injuries and operates under the supervision of a fellowship-trained sports medicine physician. What sport has the most injuries? Surprising to some, basketball players are most susceptible to athletic injuries, followed closely by cyclists. Of course, football and soccer injuries rank near the top. But did you expect swimming to also be a common cause of sports-related injuries? The number of injuries caused by a sport is probably related to the number of people who play the sport as much as it is due to the risks of the sport. For instance, there are more basketball injuries than football because the latter is primarily played by boys and young men. On the other hand, basketball is played by both sexes in every age group. Every sport carries a risk of certain types of sports injuries. Even low-impact sports like running, tennis, and golf can cause injuries. What are the most common injuries in sports? The most common minor sports injuries are strains and sprains resulting from the overstretching or tearing of the muscles, tendons, or ligaments. Although sprains or strains are sometimes severe enough to require surgery, they often can be treated with non-surgical therapeutic techniques. 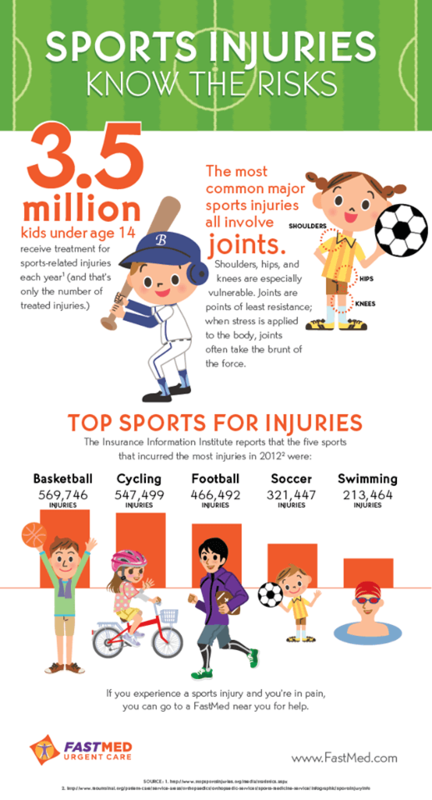 The most common major sports injuries all involve joints. When stress is applied to the body, joints often take the brunt of the force, and the soft tissues in the joint become strained or torn. Examples would be sports knee and ankle injuries, shoulder injuries, and injuries to the hips. Head injuries are a particularly serious risk for athletes. While they are less common, they are often much more serious than joint injuries, and they can lead to brain damage or even death. Concussion is the most common head injury. Football is notorious for head injuries, but other sports are not free of the risk. Any impact to the head should be treated as a serious injury until a doctor can examine the athlete. Participating in sports can also lead to ongoing issues, such as lower back pain or neck pain. Sports medicine specialists have spent a great deal of time studying the human body in athletic performance to make recommendations on proper technique. Following these recommendations can help avoid injury and the development of long-term pain issues. Winning isn’t everything. Athletes must also ensure that their bodies can perform over time. How to prevent injuries in sports? Lift Weights. One way to protect joints is to strengthen the muscles around them. Hit the weight room as a part of your training routine. Stretch. Not only does stretching before play warm up your muscles, making them more mobile, they will also loosen up so they are less likely to rip. Rest. Don’t over-train; tired muscles are more susceptible to strain. Take at least one full day off from training per week. Get the right equipment. This step is especially important in contact sports. Wear well-maintained and effective gear like helmets, pads, and shin guards. Don’t ignore pain. Muscling through it is not the way to go; you’ll likely exacerbate your injury. If you’re in pain, rest. If you feel some strain, but not enough to keep you out of practice, then wear a brace on the affected area until the feeling subsides. Your body will let you know if it’s injured—listen to it. Work hard. Don’t skimp in practice. Don’t take the easy way out. If your technique is in top shape, you’re more likely to be nimble and strong, so that you can avoid mistakes that lead to acute injuries and repetitive-use injuries born of bad form. Where to get sports injury treatment in Arizona? You can count on FastMed Sports Medicine for immediate sports injury care. You’ll get top-notch care without having to wait hours in the emergency room, or days for an appointment. The FastMed Sports Medicine program, available at select clinics in Arizona, offers acute and chronic treatment to specialized sports injuries. Whether you have a dislocated shoulder, a broken wrist, or a sprained ankle, we’ll get you fixed up and back in the game. If your shoulder or elbow has been bothering you, or your knee pain just won’t go away, let us help you figure it out so you can get back to being active. Not all sports-related issues involve muscles, tendons, and bones. We offer full spectrum sports medicine care, handling any medically related problems that may limit you from participating in the activities you enjoy. After you’ve received sports injury treatment, you may need sports rehabilitation therapy. At FastMed Sports Medicine, we can refer you to a specialist in your area. We’ll send them all relevant medical records, with your express written permission and under strict privacy rules, and can even make an appointment for you. FastMed also provides dedicated women’s health services for a wide range of women’s health needs. * The content presented on this page is not intended to diagnose health problems or take the place of professional medical care. FastMed is the largest urgent care operator to be awarded the Joint Commission Gold Seal of Approval.